n a bid to prevent fence sitters in the state unit of the Congress from joining the dissidents camp led by union Health Minister, GhulamNabi Azad, the PCC President, Saif-ud-Din Soz, has assigned party work to some senior congress leaders.When he picked up Mangat Ram Sharma,Dharam Pal Sharma, Amrit Malhotra and Hari Singh for the job of assisting him in running party affairs Soz has demonstrated that he continued to enjoy the upper hand in the organisation. 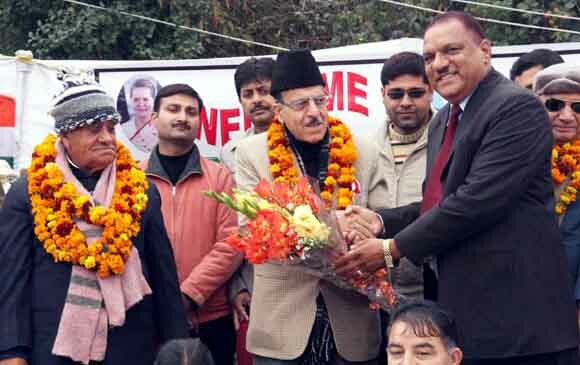 Party sourcs said that the Congress high command has decided to lend full support to Soz in the task of strengthenining the organisation in the state.It is in this context that series of party rallies and public meetings were being held in various areas of the Jammu region these days which are presided over by Soz.Thse sources said that majority of congress leaders including ministes,former ministers,legislators and former legislators have already extended their support to Soz. They said that the dissident camp is being run by people who were defeated in the 2008 Assembly election.They were being supported by two ministers,couple of legislators and some defeated candidates.Reports said that at present the relations betwen Soz and Chief Minister,Omar Abdullah,were very cordial and the two have been consulting each other before important decisions were taken.According to these reports,the selection process for appointing chairmen various Boards and Corporations got delayed because Soz had been out of the state and had gone to Saudi Arabia as member of the Indian Haj delegation.During his absence Chief Minister could not finalise the list. Indications are that the two may sit together shortly and clear the names of people who would head these Boards and Corporations.